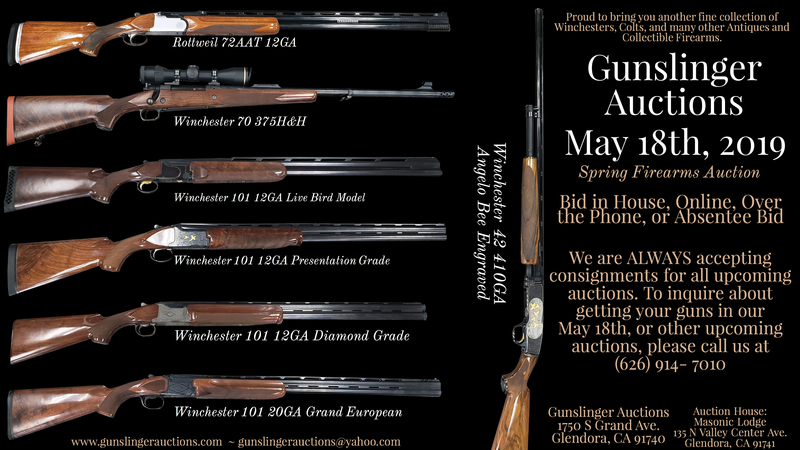 Gunslinger Auctions invites you to join us for our upcoming May 18th, 2019 Spring Firearms Auction. We are now accepting guns for this auction. We are already over a quarter of the way full! Please call us at (626) 914-7010 or email at gunslingerauctions@yahoo.com to inquire about getting your guns and collections featured in our Spring Firearms Auction. Keep an eye on this thread to see some of our best guns featured in this auction. Last edited by progunman; 01-31-2019 at 1:25 PM..
Last edited by progunman; 01-31-2019 at 9:24 AM..
Last edited by progunman; 01-31-2019 at 1:26 PM..
We are already well over half way full for our May 18th Auctionl! Get your guns in NOW so that you don't miss your chance! We are NOW posting videos on our Youtube channel! View our two newest videos on two of our best guns in auction! A Winchester Model 12 in 28GA, and a beautiful Winchester 42 engraved by Angelo Bee! View the links below NOW! Last edited by progunman; 03-16-2019 at 9:31 PM..
View our two newest videos on our best guns in auction! Don't forget to subscribe to our YouTube channel! We are posting videos DAILY. Ready for our daily youtube videos? Here they are! This time we introduce the Browning Citori Model 525 and the 1884 Springfield Trapdoor Rod Bayonet that will both be featured in our May 18th Auction! In todays youtube videos, we feature the Browning Medalist and Samurai Sword made in 1675 that will be in our May 18th Auction. Subscribe to our Youtube channel so you never miss a video! Todays YouTube Video! Check out this Winchester Model 70 Safari Express that is coming up in our May 18th Firearms Auction! Okay Calguns Community, get ready! We just uploaded FIVE new videos to our Youtube Channel, all of which feature guns that will all be in our May 18th, 2019 Spring Firearms Auction!! View each video below! And don't forget to subscribe to our youtube channel! Three more videos now posted to our YouTube Channel all about guns featured in our May 18th Firearms Auction! Subscribe! Last edited by progunman; 04-03-2019 at 4:03 PM..
Just uploaded ANOTHER Youtube video! Check it out! Heres our second video upload today! Check out our two new youtube videos! WOW! We just got in 120 extra guns for auction. We were not expecting this! This is gonna be a BIG auction this May 18th! Our May 18th Catalog is up! Sign up now and start bidding! All times are GMT -8. The time now is 2:05 PM.